Besides sphere and plane intersections another important one is the ray / triangle intersection, because most 3D models consist of triangles or can be converted to such a representation. So let’s learn how to do it to be able to model some complex models. 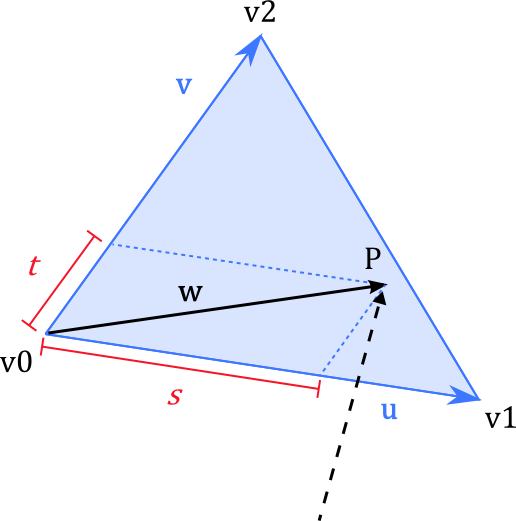 A triangle $$T$$ can be represented by three points $$v0, v1, v2$$ that define a plane. So first, we check if the ray intersects this plane. I already did a tutorial on ray / plane intersection so I won’t cover it again. If there is such an intersection it means we just have to check if this hitpoint $$P$$ lies within the bounds of the triangle. For this we calculate a different representation of $$P$$ with respect to the triangle: As the point is on the plane, it can be written as $$P = v0 + su + tv$$ for some $$s,t$$ where $$u$$ and $$v$$ are the “edge vectors” incident to $$v0$$. Assume we have checked that $$P$$ lies inside the triangle’s plane, then we just have to solve $$P = v0 + su + tv$$ for $$s,t$$, or equivalent $$w = P - v0 = su + tv$$. 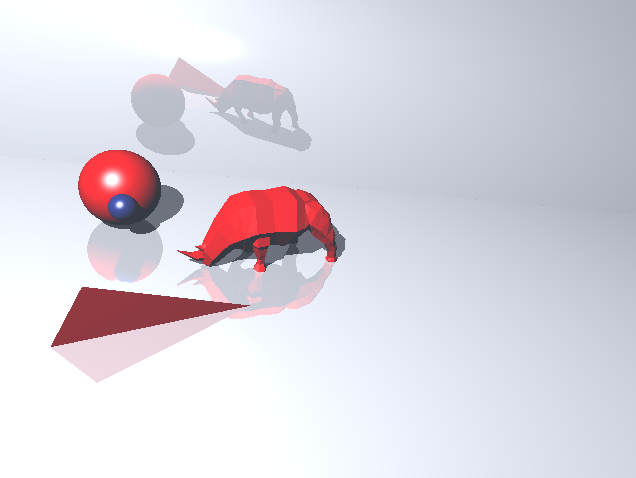 In the case of raytracing where we shoot a ray through the scene for every pixel, we can save a lot of computation time by caching some of these values. In fact, the only term that depends on the ray is $$w$$, whereas $$u^\perp, v^\perp, u \cdot v^\perp$$ only have to be computed once for each triangle. You can now import a 3D model consisting of triangles in .obj format, parse the triangles and do your ray test. This is what the result might look like, a lot better than just planes and spheres.